Elko is the biggest city on Interstate 80 between Salt Lake City and Reno. However, hidden off the beaten track are opportunities for the traveler to appreciate all the area has to offer. 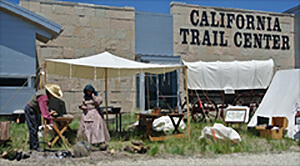 Elko’s western heritage can be discovered at the California Trails Interpretive Center which highlights the 2000 mile to California journey of early pioneers seeking land, gold, a new way of life. Life size dioramas, original murals and exhibits depict their journey as well as the lifestyle of the native people they encountered. Learn of the successes of the Bidwell – Bartleson party and the events that led to the Donner Party disaster. Hike accessible trails, visit a wagon encampment and see a Shoshone village. Visit the Northeastern Nevada Museum where the flagship collection is legendary western artist Will James featured in the second largest collection of James’ art and books in the world. View a collection of cultural, economic and early settler artifacts as well as an extensive historical archive that includes photos, newspapers, records, maps and manuscripts dating back to 1872. Located in the historic Pioneer Hotel, the Western Folklife Center (home to the National Cowboy Poetry Gathering) is dedicated to the preservation and presentation of the culture of the American cowboy. Activities include concerts, exhibits, workshops, educational programs and a gift shop. The Sherman Station Ranch House and five outbuildings are located in the heart of Elko, next to the museum. This historic timber pine ranch house and outbuildings were relocated to Elko from Huntington Valley in 1997 and are used as the headquarters of the Elko Area Chamber of Commerce. Guided and self-guided tours allow visitors to view the stable, blacksmith’s shop, creamery and a one room schoolhouse all reminding visitors what the ranch looked like over 100 years ago. The most recent addition to the Elko historic preservation efforts is the Cowboy Gear and Arts Museum, located in the original G.S. Garcia store. Enjoy western artifacts and collections on display representing the historic ranch and rodeo lifestyles. Tour historic mining towns, take a tour of a modern gold mine and experience some of the finest cultural dining you will ever experience at one of our famous Basque restaurants. For additional itineraries, area or event information, visit www.ExploreElko.com.